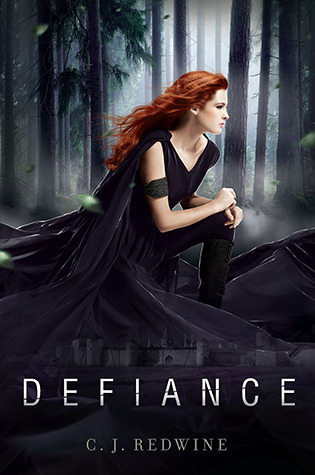 Defiance (Defiance #1) by C.J. Redwine. Publication : August 28th 2012 by Balzer + Bray. Set in a dystopian world (slightly along the lines of a post-apocalyptic setting),Defiance begins with Rachel, waiting for her father's return at the gates of the city of Baalboden but he doesn't show up, causing the leader of the city to declare him dead. However, Rachel believes that her father is still alive and refuses to give up; so along with her newly assigned Protector, Logan, she tries to figure out a way to reach her father. My review's going to be pretty simple. Redwine's writing is excellent and on the powerful side. The characters are strong and even the story is fast-paced and gripping. That's all that's usually needed. Rachel is a really strong protagonist and Logan's is definitely hot and at certain times, even adorable. If you're new to the dystopian genre, you'd rate Defiance 4/5 or heck, even 5/5. It's everything that someone looks for in a YA novel. However, I was a little disappointed - not with the writing or the story itself but my problem was mostly just that the basic storyline for Defiance is nothing new. There's an evil man, a strong girl and hot guy who plays the protector (in this book, literally). There's also other dystopian elements that pose danger to the people; in the case of Defiance it was the Cursed One. To put it simply, I was bored and I wanted more. It's too similar to various other young adult novels in the genre. I know, I know, I sound contradictory but like I said, the book is good, I just wanted something new. I guess I was in the mood to read a novel that would blow me away but it didn't happen. Also, like I said, Logan's hot and all but I would've liked the romance better if I got to watch Logan and Rachel's relationship grow from scratch - the first time they meet. They already knew each other, there was already chemistry and all that and C.J.Redwine certainly pulled it off but I just didn't get as attached to the characters as I could have. I should probably mention that it wasn't all predictable, Redwine still added some elements that I haven't come across in other novels much, such as the tech stuff/gadgets. That was cool. Oh well, having said that - Defiance is good, people. It's better than good, if you're new to the genre. If you're not, depending on whether you're okay with reading the usual YA dystopian stuff or you're looking for something new, you might love it or you might just like it. Don't worry, there's no way in hell that you'll dislike this novel. Either way, definitely worth a read! Dystopian books are becoming so cliche. I mean every single one has a tought main girl/boy, bad society that makes them do stuff, main character suddenly realises all that is bad and wants to fight. I don't read HUGE amounts of dystopian so the book sounds pretty appealing to me. I really like the concept of it and that it seems to portray a strong female figure. The cover is also really nice! I'll have to add this one to the TBR pile. I have really wanted to read this one. I love dystopian and am starting to be more picky about which ones I read though. Really interesting review, thanks! I strongly recommend this amazing book! it'll put you on the edge of your seats, while also having you reach for a box of tissues.